Coming May 24th from Shout! Factory's Roger Corman Cult Classics line is a 2 DVD collection featuring Eat My Dust! (1976) and Grand Theft Auto (1977), two of Corman's best loved films. Best known for their star Ron Howard, Grand Theft Auto also marked Howard's directorial debut for which he would eventually be acclaimed for. 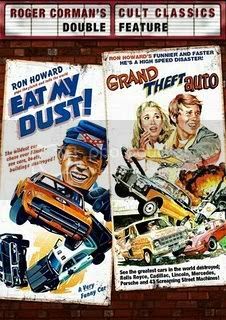 At the time these films were made, Ron Howard was a hot commodity thanks to his appearance on the popular TV series The Andy Griffith Show and Happy Days, so it was only natural for Corman to scoop him up to star in Eat My Dust!, which went on to be a big money maker. This set features both films and a ton of bonus features, some of which are brand new! Eat My Dust! stars Ron Howard as trouble making teen Hoover Niebold who works odd jobs at the local racetrack. Hoover is in love with Darlene, a beautiful blonde who he would do anything for, which he proves by stealing a race car and taking her and some friends for a joyride. Hoover's father, the sheriff, tries to protect his son while also trying to catch him by enlisting a group of racers, including the stolen car's owner Big Bubba Jones (The Partridge Family's Dave "Reuben Kinkaid" Madden). Hoover proves to be an ace behind the wheel, destroying anything in his path (including an entire farm! ), but will it be enough to win Darlene's heart? Grand Theft Auto stars Howard as Sam Freeman and Nancy Morgan as Paula Powers, a pair of lovebirds from different backgrounds. Nancy is from a wealthy family and is supposed to marry rich snob Collins Hedgeworth (Paul Linke). Sam and Paula decide to steal her father's Rolls Royce and elope to Las Vegas. Of course Paula's parents are outraged and put up a reward over the radio to whoever can catch her. This causes a mass hysteria for anyone with a set of wheels, which only gets worse when her intended husband puts up his own reward. Can this young Romeo and Juliet make it to Vegas or will they be caught by one of the bounty hunters? Shout! Factory have outdone themselves again with this exhaustive set of two 70s Drive In Classics deserving of a special release. Collecting numerous special features from previous releases (interviews, trailers, making of featurettes, commentary with Ron Howard and Roger Corman and a separate commentary with Rance Howard, Joe Dante, Allan Arkush and Ben Haller) as well as a brand new interview with Ron Howard and new Anamorphic Widescreen Transfers, this 2 DVD set is a must. Of the two films, I prefer Eat My Dust! for its non-stop action and more innocent feel, but they are both a lot of fun. Car chases (and crashes) and zany characters make these films perfect for any fan of drive in flicks, cult movies, car chases, action or comedy pictures.